Iranian dissidents must be moved out of Camp Liberty and Martin Kobler sacked and replaced with an 'impartial' representative in Iraq, a European Parliament’s vice-president has told the UN's Security Council. And pending the transfer, Iraq must return medical equipment and bullet proof vests, helmets and blast-proof T-walls to protect vulnerable Camp Liberty residents from further attacks, Dr Alejo Vidal Quadras demanded in a strongly-worded letter to world leaders at the United Nations. He also blamed Martin Kobler's collaboration with the Iranian regime through the Iraqi government for blocking a safe solution to the crisis, and for preventing all but a very few dissidents from being transferred to safety in Albania. December 11, 2012 - A day after the “UN Human Rights Day” cross party parliamentarians gathered in the House of Commons to condemn human rights abuses inside Iran. Amongst the speakers were a former Home Secretary and a former senior UN human rights official. They demanded support for Iran’s legitimate opposition movement and the recognition of the National Council of Resistance of Iran (NCRI) as the future interim government of that country. While much has been made of the Iranian regime’s nuclear ambitions, the speakers were determined to highlight the continued suffering of the Iranian people. 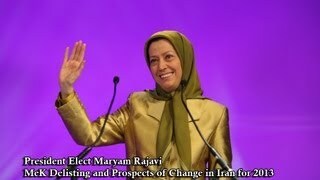 The conference was addressed by Mrs. Maryam Rajavi, the President?elect of the NCRI. She told the gathered members of parliament via video link that, “...the West must make the continuation of their political relations with the regime conditional on the ending of hanging and torture of prisoners.” Mrs. Rajavi ended her speech by demanding an entire change in Western policy, to one which has at the heart of it regime change and the overthrow of the current regime by the Iranian people and their opposition movement. ISDCI, September 17, 2012 – The last major group of Ashraf residents in Iraq left the camp yesterday to a new location called Camp Liberty. That is following a three year struggle by the residents who are Iranian dissidents living in Camp Ashraf for over 25 years fleeing atrocities of the Iranian regime. The struggle included two major attacks by Iraqi forces on the unarmed residents leaving 47 women and men killed. Conference at National Press Club, Washington D.C.
Introduction: by Dr. Ivan Sascha Sheehan: Good Afternoon, Welcome to the National Press Club and welcome to today’s talk on US-Iran relations. My name is Ivan Sacha Sheehan and I am the Director of the Graduate Program of Negotiation and Conflict management it the College of Public Affairs at the University of Baltimore. It is my great privilege and distinct honor to introduce our distinguished guest at today’s luncheon. A man that needs no introduction, the honorable Newt Gingrich. Now as I said Speaker Gingrich is a man who needs no introduction, I am going to give him one anyway. And I should note that a proper recounting of his extraordinary political accomplishments and his leadership responsibilities would keep you here for the better part of the day. 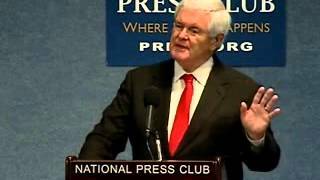 For more than thirty (30) years Speaker Gingrich has been at the epicenter of American politics driving the headlines, leading the conservative cause, frustrating Democrats and speaking out on domestic and international issues of importance to the United States and the world. My thanks to the Committee on Foreign Affairs for inviting me to testify today, and to the Chairman and Ranking Minority Member of the Subcommittee on Oversight and Investigations for welcoming me to this hearing. I am honored to join in your important deliberations, and offer the following views in my personal capacity. 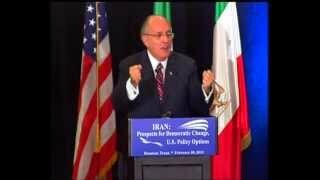 I begin my testimony with three disclaimers: First, I have not been to Camp Liberty. Second, I have not been a first-hand witness to interactions over the past year between the United Nations and the State Department; and third, like many people I can only speculate on the extent and nature of Iran’s influence with Iraqi leaders or inside Iraq generally. What I can and will do is tell the Subcommittee what I know, and offer my recommendations on how best to safeguard American interests in this complex situation.